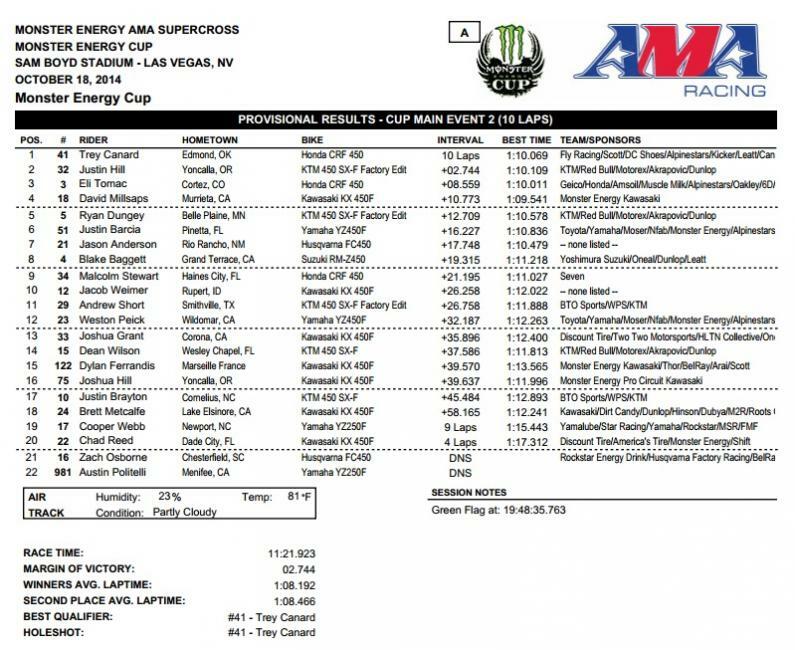 Day Feed from the Monster Energy Cup, the last race of the year and the final time these riders will meet in competition before the 2015 season of Monster Energy Supercross. We’ll keep this section updated as the day progresses, so be sure to check back often for news as it becomes available. You can follow us on twitter (@racerxonline) as well for up to the minute information. You probably already know how the Monster Energy Cup works, but if you don’t, here’s a quick rundown. There are three different main events, with the scores from each added together to determine the overall winner. Win all three and you win the Monster Million. Holeshot all three and you’ll win a brand new Toyota Tundra. If nobody wins the million, the winner earns a coole $100,000. The track also has a feature called the Joker Lane, which is a detour that adds a few seconds onto a rider’s lap time. Riders are required to take this lane once per main event. 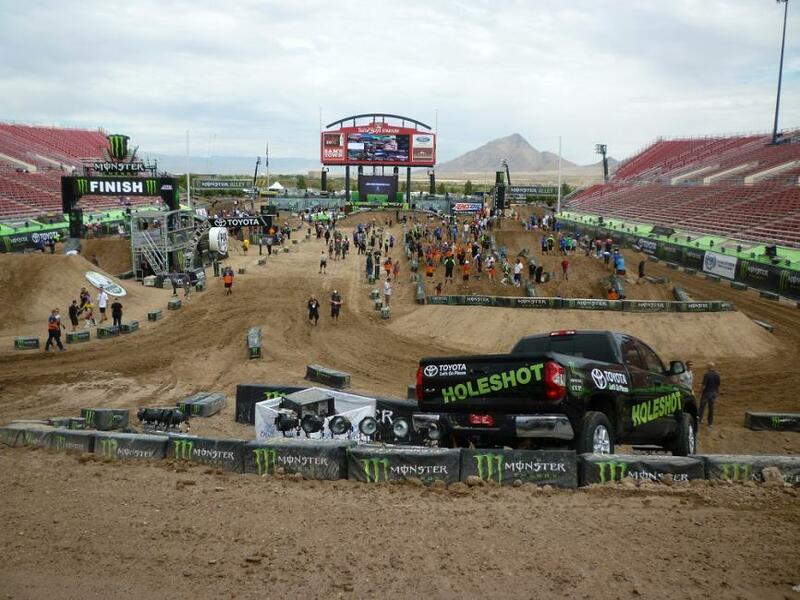 If they miss it, like Ryan Villopoto and Ryan Dungey did last year, they’ll be penalized. When Dungey missed it last year it cost him five spots. Now you know how it all works! The final gate of the night dropped with the Monster Million still on the line. All Trey Canard had to do was do what he did in the first two races, and the money and Tundra would be his. Unfortunately things starting going wrong for the Team Honda rider right away when he got bumped off the start and didn’t nail down the holeshot, which would have handed him the Tundra. That’s okay, the Honda rider would have probably just traded it in for a Ridgeline anyway, but the bad luck didn’t stop. 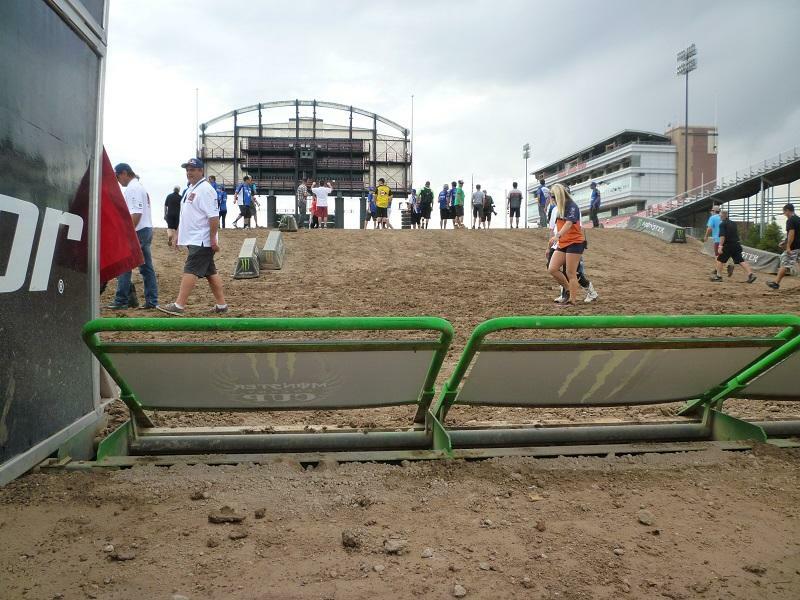 While going after Davi Millsaps for the win, and the million, Canard went down in Monster Alley entering the stadium. He still had a shot at the overall and the $100,000 though, and he remounted and started charging, only to go down yet again several laps later. The benefactor was Millsaps, who went on to win the race, and the $100,000, after sitting the last year-and-a-half out. By the looks of it, the time off hasn’t hurt him much. Heartbreak of the night goes to Justin Hill, who went down on the start and got run over. Credit to Hill for getting back in it after what looked like a vicious crash, but had he not crashed he would have been in a position to win the overall in his first race aboard a 450. 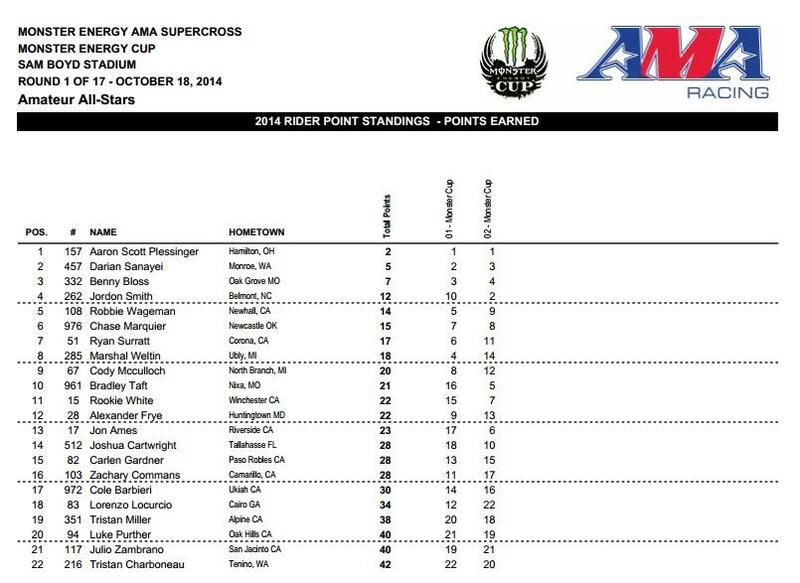 Another good start for Darian Sanayei put him in the lead initially, but it was again Aaron Plessinger who was all over him almost immediately. After a few laps Plessinger would take over the race and check out. Elsewhere it was Benny Bloss and Jordon Smith going at it for third, with Smith making the move about halfway through. On the last lap he was all over Sanayei, and in a move of desperation he busted out the triple-triple-triple combo and made the pass for second. No worries for Sanayei though—he had second overall wrapped up no matter where Smith finished. Several different pileups on the first lap of this one prompted a red flag. On the restart it was Mitchell Falk with the holeshot followed by Chase Sexton, Casey Keast and Garrett Marchbanks. While Marchbanks got stuck in a battle with Keast, Sexton and Falk got away up front. They put up a great battle for the win that went all the way down to the final lap, but just like in the first race, Falk refused to give into the pressure and won the race for a perfect 1-1. Behind them Marchbanks was able to get the better of Keast, which handed second overall to Marchbanks. Another main event down and the Monster Million is still in play for Trey Canard. So is the Toyota Tundra, as Canard holeshot the race and took the checkered flag. 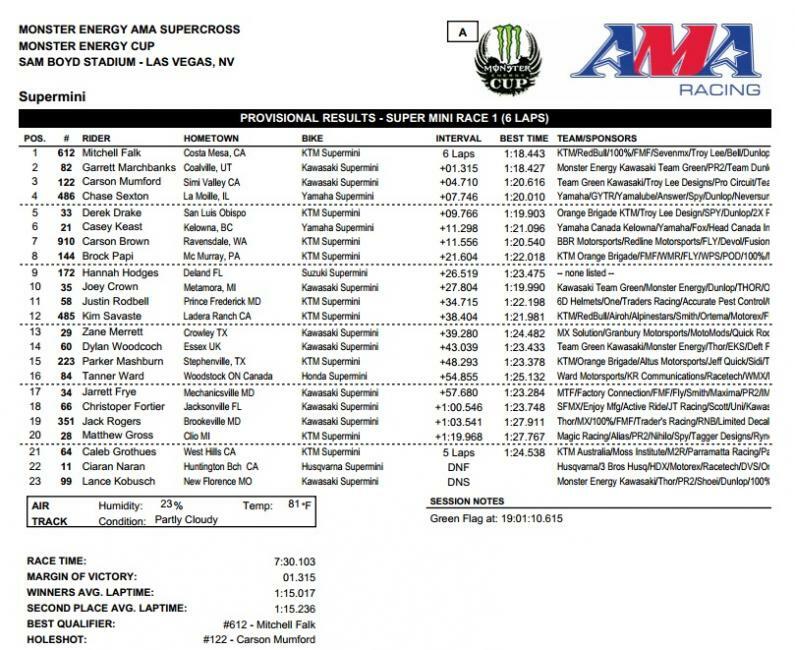 It wasn’t a wire to wire race though—Davi Millsaps inherited the lead when Canard dipped into the Joker Lane. The crowd waited for Millsaps to follow suit, but as the laps wound down Millsaps still didn’t take it. He finally ducked in on the final lap, but disaster struck when he went down while exiting the lane, coughing up additional spots to Justin Hill and Eli Tomac. Barcia had another good race going early but ended up losing a few more spots. It looked like he had fifth wrapped up, but Ryan Dungey made a charge and gobbled Barcia up on the final lap. Dean Wilson had some issues and was running dead last at the beginning of the race. Zach Osborne also had bad luck and crashed out of this one. The first lap of this race was a bummer for Jordon Smith, who went over the bars in the triple-triple-triple rhythm section. It wasn’t so much of a bummer for Darian Sanayei though, who took off with the early lead. But it didn’t take Aaron Plessinger long to close the gap, and once he got close he made a move stick on Sanayei and took off for the win. This one was a nail-biter up front. Mitchell Falk got out to the early lead but Garrett Marchbanks did everything he could to take it away. He caught up to Falk and pressured him a few times, but Marchbanks held tough for the win. The sheer size of these jumps might not translate on television, but it’s pretty impressive that most of these Super-Mini riders are launching just about everything the big bikes are. The first main event was all Team Honda Muscle Milk’s Trey Canard, but it wasn’t without a little pressure from Red Bull KTM's Justin Hill, who is racing the 450 for one night only before stepping back down to the 250. Almost immediately they opened up a big gap with Hill staying close, but not quite close enough to run it in on Canard. Canard led from wire to wire, making him the only man now eligible to take home the Monster Million. Since he holeshot, he’s also the only man eligible to take home the new Toyota Tundra. Behind the two leaders it was Justin Barcia, but he ended up fading back to sixth. His teammate Weston Peick didn’t have the best race either—he went down in the Amsoil Arch and got trapped under his bike. Jason Anderson also went down in the arch while running third. 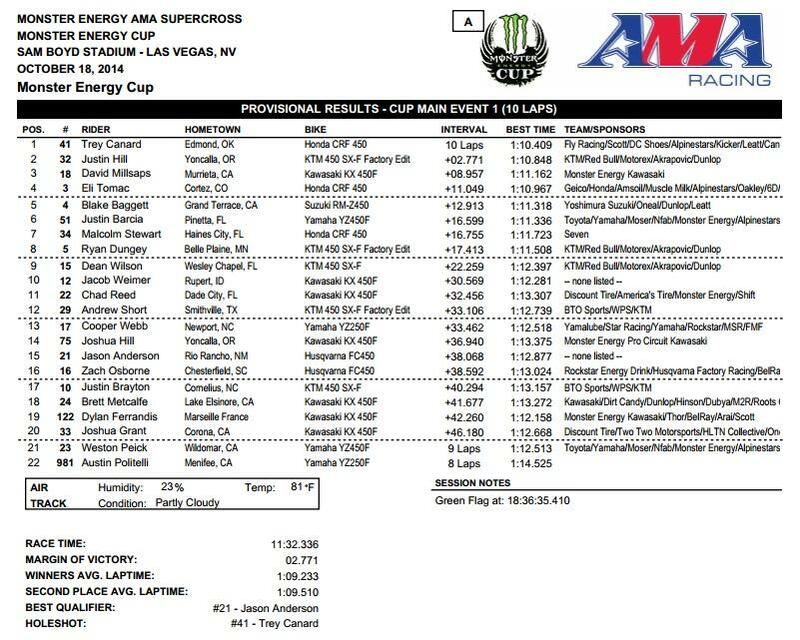 Tomac rode well (him, Canard and Hill were the only riders to log laps under 1.11.00) but shocker, a so-so start hindered his results. The field is set for tonight's main events. The final four were determined by the LCQ. It was the newest member of Discount Tire/TwoTwo Motorsports, Josh Grant, who would grab the holeshot over Cooper Webb, Zach Osborne and Weston Peick. Grant would lead the entire race to claim his spot in the night show. 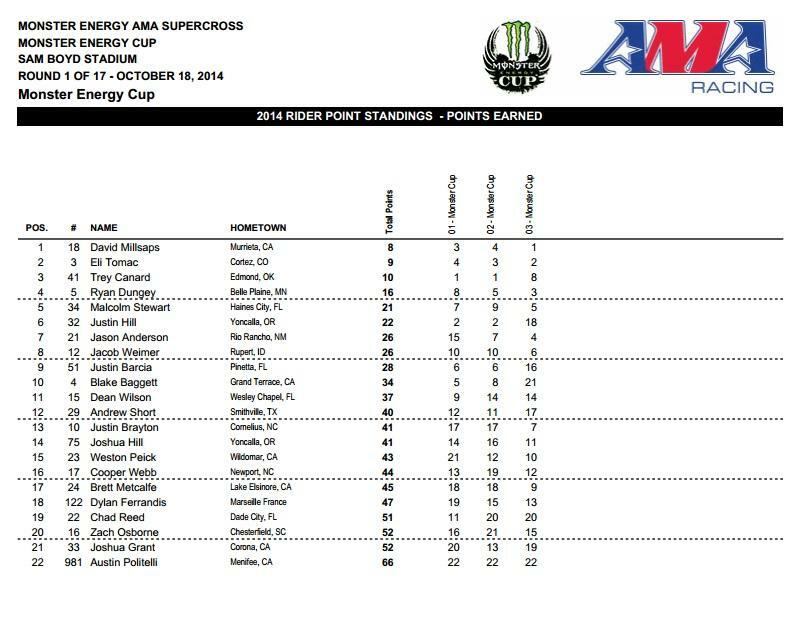 The top four never wavered, with Webb, Peick and Osborne all advancing. 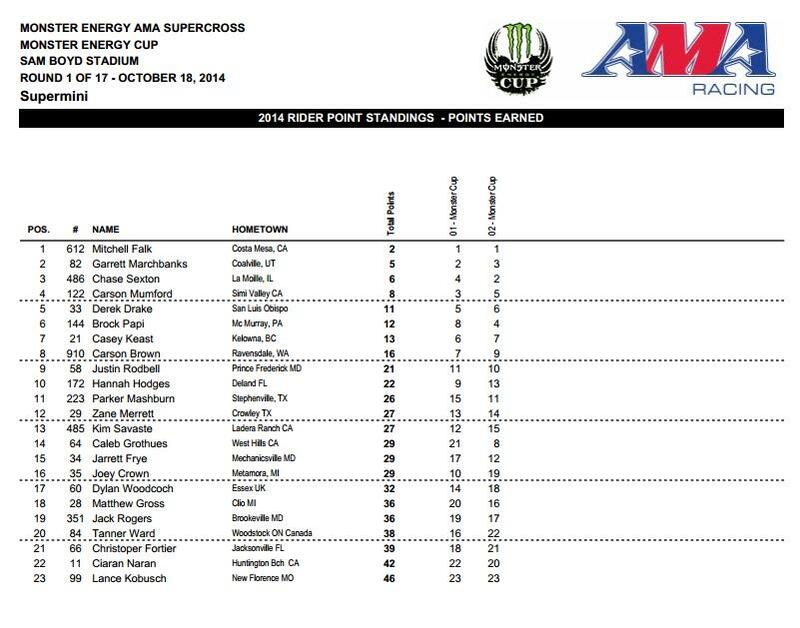 Those who did not advance include Austin Politelli, Matt Goerke, Kyle Chisholm, Mike Alessi, Jimmy Albertson, and Nick Wey, among others. Make sure to watch the action live on Fox Sports 2 beginning at 9:00 p.m. ET. Fox Sports 1 will re-air the race tomorrow at 1:00 p.m. ET. 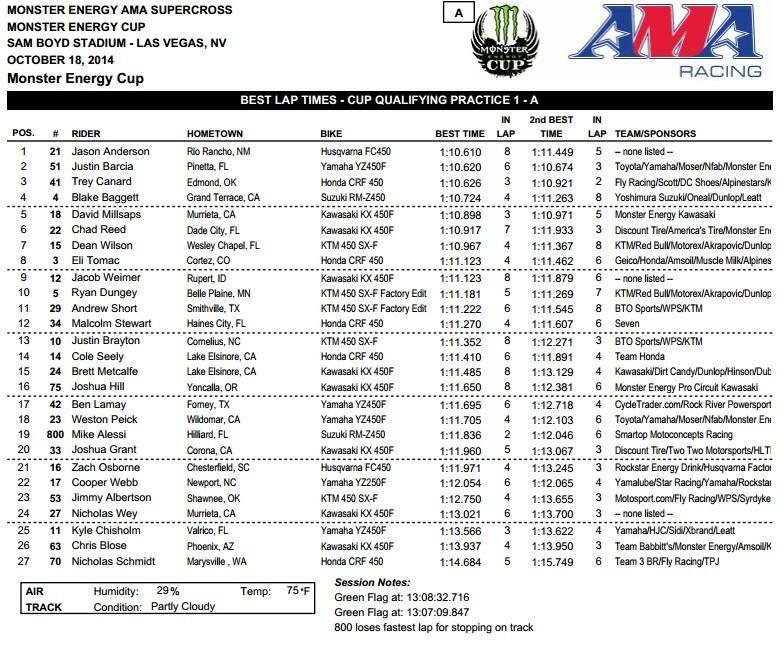 Practice is over here in Las Vegas, and thanks to a wet track, times were substantially slower, rendering the session somewhat useless in terms of lap times. But that doesn’t mean there weren’t a few things to learn. First off, Cole Seely did not go out for the final qualifier after taking a digger in the first. He’s okay, but he’s out of action for the night. Second of all, it became more obvious how important it’s going to be to get through the triple-triple-triple rhythm section cleanly. Even small bobbles were resulting in guys losing their flow and being forced to double the rest of the way out, which is much slower. Last of all, Dylan Ferrandis of the winning French Motocross of Nations team, is here and he’s fast. His times are on pace with some of the fastest of the day and it’s going to be interesting to see how he holds up in actual competition. 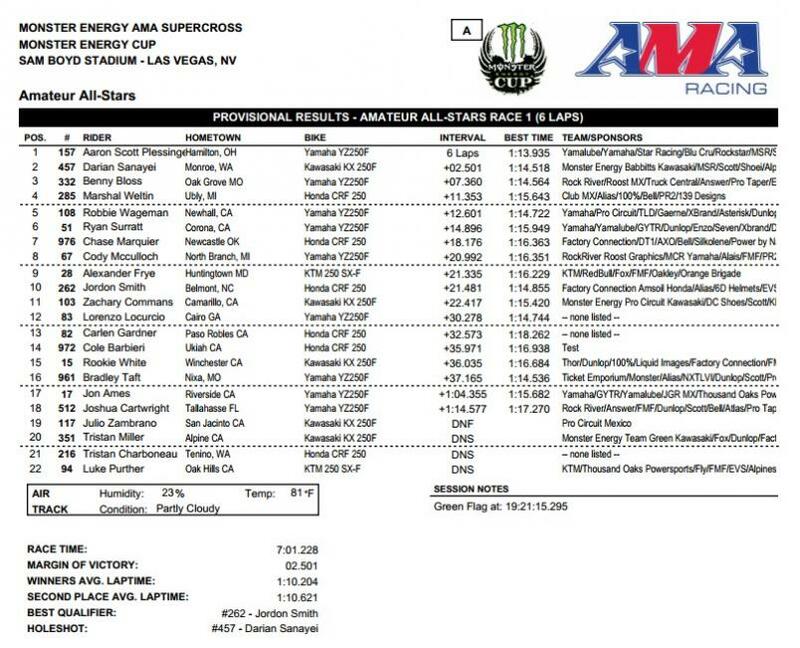 The top eighteen riders in the list below advance to tonight’s mains, with guys like Cooper Webb, Josh Grant, Mike Alessi, Weston Peick, Zach Osborne, Jimmy Albertson and more all fighting for the final four transfer spots in the LCQ. There just might be blood. .The talking points from the first qualifier don’t really involve what happened out on the track—it was largely uneventful except for Jason Anderson topping the bunch. What’s noteworthy is how close the top times were. The top fifteen were separated by less than a second! You could even call it the top seventeen if you include Justin Hill and Dylan Ferrandis, who were in the B group. Hill notched a 1:10.672 and Ferrandis a 1:10.809. 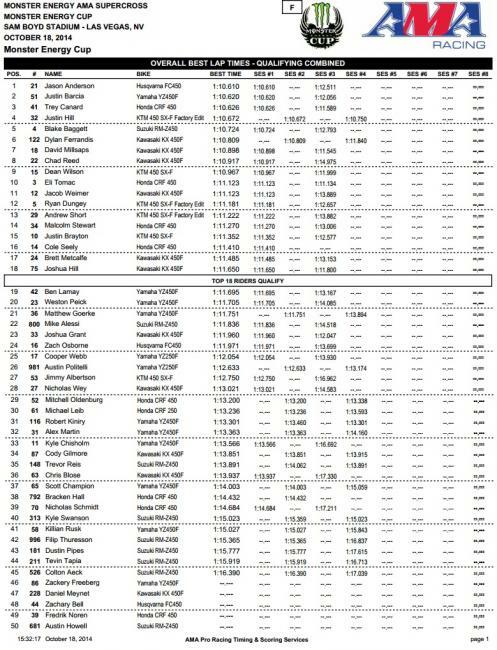 The tight times are likely due to a track with one obvious line through the main rhythm lane and the lack of whoops. In any case, let’s hope it stays this close tonight! The answer to your question is no. We’re talking about James Stewart of course, and his status at the Monster Energy Cup. It’s a bummer for Stewart fans, but there are plenty of other huge names here today and you can be certain that we’re in for some good racing. And if you’re wondering about Chad Reed, who stated earlier in the week that it’d be a game time decision whether or not he’d race tonight after getting banged up at the Motocross of Nations, he’s in and will be joined by TwoTwo Motorsports’ newest rider, Josh Grant. Other riders making debuts with new teams include Davi Millsaps, Justin Barcia, Weston Peick, Blake Baggett, Justin Brayton, Cole Seely, the entire Rockstar Energy Racing Husqvarna team and many more. Three holeshots wins the truck. The track they’ll do battle on is as cool and innovative as the MEC track always is, with a few new items sprinkled in to keep it fresh. The most noticeable addition is the split start. They’ve run a split start before, but the pack merged as soon as it entered the stadium. This year the two individual groups will stay separated and rocket down extremely long drag strips that run the length of the stadium before two flat 180 degree turns slow the riders down and funnel them together safely. Expect speeds to break seventy mph here. Another addition is the jump combo in the Joker Lane. There’s a single, table and another single. So far the obvious choice has been an on-off. There’s also a booter of a triple here too. As far as supercross triples go it’s not especially long but it’s throwing the riders up extremely high. If anyone flat lands this one it’s going to hurt! There's a roller immediately following the starting gate. As far as the weather goes, it's nicer today than when supercross races here in May; highs are expected to be in the mid eighties, not 100 plus. That said, it feels warmer than it is thanks to some uncharacteristic humidity, although it's nothing compared to some of the East Coast rounds of Lucas Oil Pro Motocross.